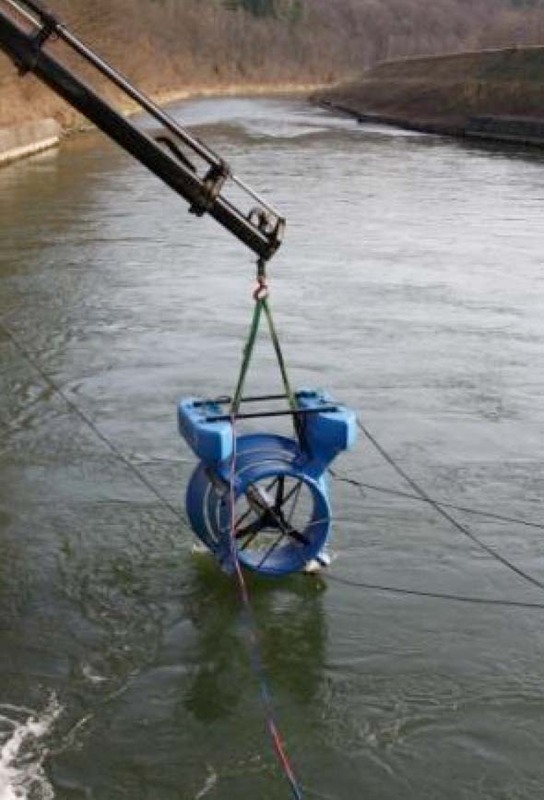 Munich, Germany – On Monday April 4th Smart Hydro Power successfully revealed its first 5kW micro-hydro turbine system to an international audience. 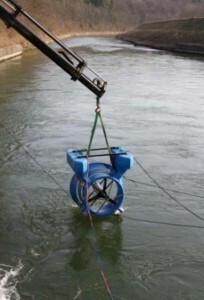 Despite pouring rain, the company´s bright-blue turbine was floating calmy in the water during the event which took place at E.ON´s hydroelectric facility on the Isar River. Unlike PV, the turbine proved that it is able to supply domestic appliances with converted AC power immediately. Because the turbine doesn´t require further infrastructure or major maintenance costs, it can compete with diesel generators on a micro grid, as well as standard electricity provided via the public grid. In conjunction with the turbine presentation, Smart Hydro Power hosted a small roundtable discussion with the title “Decentralized Electrification: A Unifying Framework for Decentralized Energy”. The roundtable consisted of 10 representatives of various public and private entities with active interest in global electrification, research and development projects. Some of the participants included Dr. Maritta Koch-Weser of the non-governmental organization Earth 3000 (Germany), Wim Klunne of state-funded research institution CSIR (South Africa), and Klaus Jorde of the energy consultancy group Entec AG (Switzerland). The focus of the meeting was to streamline the success of electrification projects in developing countries. Karl Kolmsee, CEO of Smart Hydro Power and moderator of the roundtable said, “Our discussion highlighted the necessity for a translation between social scientists and engineers in the implementation of decentralized electrification projects”.